As summer transitioned into one of the most beautiful fall foliage seasons, reports of high visitor traffic, and increases in area business seem to coincide with the increase in real estate activity and sales that we have seen in the Stowe area. Over the past 9 nine months, the number of recorded sales in our market continues to strengthen while at the same time inventory declined 18%, to a little more than 1 year's supply. The 3rd quarter was highlighted by one of the largest increases in the number of residential sales that we've seen in years, representing a 21% increase compared to the 3rd quarter of 2012. The 63 residential sales that have occurred over the past nine months, represents the highest number since 2007, which is an increase of almost 10%. 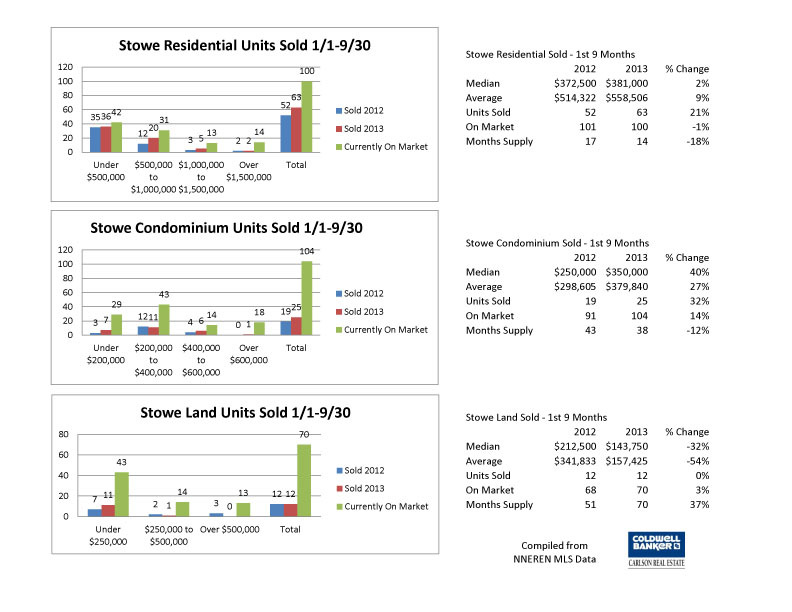 Condominium sales increased as well, up 32%, while land sales remained constant. The median and average sales prices for residential and condominiums both rose, whereas for land sales, they dropped. 57% of residential sales were under $500,000, 32% between $500,000 and $1,000,000, 8% between $1,000,000 - $1,500,000, and 3% over $1,500,000. The price range segment with the largest increase was that of the $500,000 to $1,000,000 category which nearly doubled. 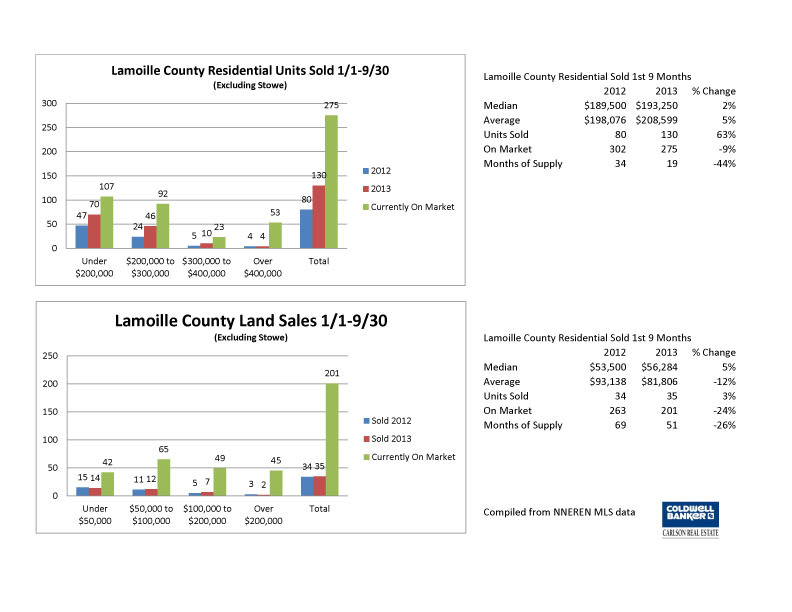 Real estate sales in Lamoille County continued to strengthen during 2013. For the first nine months of the year residential sales increased 63% - 130 in 2013 compared to 80 in 2012. Sales prices increased modestly at 2%. Fewer homes on the market combined with increased number of sales has reduced the months of supply by 44%. Land sales remain steady with 34 sales in 2013 compared to 35 in 2013, with a 5% increase in sales price. As with residential properties, the months of supply is less, a 26% decrease compared to last year. Overall, Stowe continues to be a destination location of choice for a broad spectrum of people who want to make their home here, whether it is for vacation or for a primary residence. The quality of life, the welcoming community, myriad natural resources, and the high quality of schools are just some of the reasons people choose to live here. We at Coldwell Banker Carlson Real Estate continue to be very busy with listing and selling real estate, and have had a very successful year. Low interest rates and national and economic news reports indicate that the housing market will continue to strengthen throughout the rest of the year and in to the next. Please feel free to contact me if you have any questions about the information in this report.